Hailing from the same state as the creator of Conan the Barbarian, Eternal Champion has been getting some interest on the Internet -- as it turns out, with justification. One of the recent wave of quality old-style heavy metal releases of the past few years, The Armor of Ire has both catchiness and heaviness to spare. Unusually, Sumerlands guitarist Arthur Rizk takes a turn on the skins for this side project, and the way the production lays them on the album gives a muffled, primitive ambience to the rhythm section. The guitars are thick and overdriven -- sonic broadswords. Like the utterly generic Dungeons & Dragons album art, featuring a sword-brandishing barbarian hero on a snowy mountain with a scantily clad damsel clinging to his leg, the plodding, beat of the first track calls to mind Manowar or perhaps Dio -- no great surprise there. But the title track, keyboards rippling over the top in a deceptively gentle stream, is more complex than it appears, especially after a few listens. Jason Tarpey's nasal tenor is heavily Manilla Road-influenced, reminding one of Mark Shelton's voice from the band's classic era, and the clean vocals somehow go very well with the guitars, which after all are much more bass-heavy than his singing voice. The lyrics revolve mostly around the stories of of Michael Moorcock (after all, the band's named "Eternal Champion" for a reason, right?) and Robert E. Howard. Invoker comes as somewhat of a surprise, not for its H.P. Lovecraft theming, nor even because of its lyrical narrative (the hero is fighting to prevent a cult from successfully summoning the Old Ones instead of doing what Lovecraft's protagonists usually do, which is go insane with horror over the whole thing), but due to its split style, half slow ballad, half Iron Maiden-style galloping. However, The Armor of Ire is by no means perfect. Not all the songs are quite as interesting, and sometimes the plodding beat and three-note vocals overstay their welcome. Nor is it a particularly long album, and the two instrumentals that are present are mostly ambient backgrounds that don't contribute a lot to the listener's enjoyment. The album nonetheless gets a thumbs-up. There are some good tracks here, and the retro production adds way more to the atmosphere of the songs than the instrumentals do. 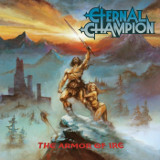 Listeners to straightforward US heavy metal of the early 80s will likely enjoy The Armor of Ire.